When it comes to workplace mobility, it’s out with the old, in with the new. According to a 2015 statement, Gartner found that 44 percent of current tablet users plan to swap out for a different device, while 54 percent of laptop users intend to bail on their machines. Your field force likely is ready for a change. 1. Their shirts don’t fit. It’s awkward, all those overdeveloped biceps bulging around the office. How did this happen? It’s likely the repeated hefting of weighty laptops. Medical science will come up with a name for it, the pharmaceutical companies will find a cure, the cost of healthcare will rise exponentially, the economy will collapse and the world will plunge into chaos. Just because you wouldn’t swap out their cumbersome laptops. Good job. At a trim 1.52 pounds, Samsung’s Galaxy Book 12 will take a big weight off of their shoulders. Does weight matter all that much? For most field workers, it does. After all, the laptop doesn’t travel solo: It goes in a bag with cords, chargers, all the day’s paperwork and an assortment of other items. For many, a drop to a pound and a half could lighten the load significantly. And at just over a quarter-inch thick, they’ll barely notice the 2-in-1 laptop is there. 2. No one wears hats anymore. It’s true. The stylish fedora has come and gone, yet your field force wears not one hat but two. There are the mobile moments, those times when what matters most is the ability to get the information out into the field to make a presentation or take an order on the go. The other hat? That’s the productivity piece, the need to run serious business applications. There comes a time for functional, end-of-the-day reporting, and a time to develop the documentation and visuals that will become tomorrow’s presentation. Change the paradigm of the split personality, and you change the way the enterprise does business. When your worker has begun to wear down a bald spot from switching hats too often, it may be time to consider a 2-in-1. 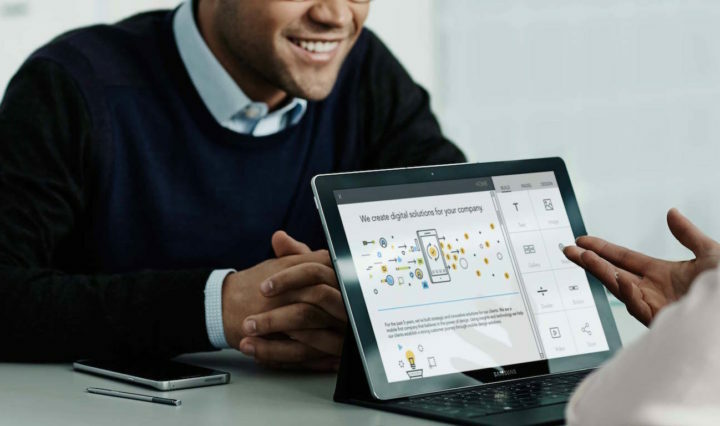 Unlike a tablet, which may run a lighter, mobile operating system, the latest 2-in-1s like the Galaxy Book 12 are loaded with the full Windows 10 Pro operating system, capable of handling the tasks a desktop might be required to address: word processing, analytics and data input. It’s fully functional, with all the office tools a field worker may need, and a full-sized keyboard included. At the same time, it’s utterly mobile, with all the features of a tablet, including an intuitive touch interface. Windows 10 security solutions keep data safe. Here are the Windows 10 Pro security features that will set your enterprise above the rest. 3. Their hands are full. It’s awkward. You go to greet the boss in the hall and suddenly you’re a fountain of electronics as cell phones tumble out of your shirtsleeves and power cords slither in your hair. Okay, maybe not. But it’s still a pain for the worker on the go who’s laden with phone, tablet, laptop, cords and sundry accessories. Solution: The 2-in-1 laptop, which reduces the armload by one weighty laptop. In field work, convenience counts. When your road warriors become more efficient, the enterprise may find new ways of doing business, as team members find themselves with greater flexibility. 4. Workers are so darn productive…they keep running down their batteries. The average laptop can only run three to six hours on a charge. The longer life of a tablet makes sense, but then you lose all that needed functionality described above. Here again you may well need a 2-in-1. The Galaxy Book 12 offers up to 10.5 hours of battery life and charges through a USB Type-C port. No more brick to carry, and they’ll get much more out of that quick recharge at the airport departure gate. 5. Flagrant self-interest. Your mobile workers are ready for a 2-in-1, and so are you. After all, there’s a cost that comes with maintaining all these devices and supporting their diverse operating systems. The more you can streamline your enterprise IT, the fewer related expenses you’re likely to face. Find out more about the latest mobile devices that will lighten your field force’s load.